Overexposure to the sun, swimming accidents / injuries in pools, lakes and even the beach can result in personal safety issues. Here are some things to watch out for, as well as quick remedies. 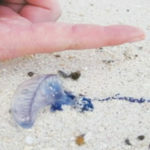 A common problem faced on local beaches during the summer is being stung by bluebottles. — Burning pain at the site of the sting. — Swollen area with red lesions that may last a couple of days. — Some people have been observed to have nausea, headaches, widespread itching and even muscle spasms. — Remove any tentacles stuck to the skin with tweezers or with gloved hands. — Wash the sting area with plenty of sea water (not fresh water as that causes further irritation). — Immerse the area of the sting in hot water. — Alternatively apply ice / ice packs (wrapped in cloth / towel) on the sting site. — Do not rub the area at all and especially do not rub sand on the site of the sting. Swimming accidents are also common in lakes, rivers, even pools, especially when people who have no swimming training take to the water. — Do not jump into the water head first, when the bottom of the pool, river or the lake is not visible. Even if it is visible, you may not accurately gauge the depth of the pool and could suffer serious head injuries and spinal damage when jumping in head first. Therefore, a safer way is to go feet first. — Avoid swimming at a point where two rivers merge, the currents are far stronger at this point and the water is murkier as the sand is constantly churning; it makes detection of a swimmer who’s gone under more difficult. — Swimming alone, if inexperienced, or even alongside other novice swimmers should be avoided if not supervised by an experienced swimmer. — Use appropriate sunscreen (seek advice from doctors especially in case of sensitive skin) and apply liberally on all exposed skin. — Children should never be left unsupervised even for a few moments, no matter what their skill level is. — Inflatable pools, widely used, should be filled and drained under adult supervision. They pose a risk to children as well as pets when left unattended. — If your property has a permanent pool then ensure that it is locked when not in use. — Running, pushing, and dunking should be avoided near and in all water bodies like lakes, ponds, pools, etc. — Ensure CPR is taught. — No one should fake a drowning incident in water. — Enforce the buddy system when swimming in groups to ensure that everyone keeps an eye on each other. — Enrol in swimming lessons but, irrespective of the skill level, always treat the water with respect and remember that a false move could be fatal. — Broken bones, neck, head, spinal cord injuries, even electric shocks, can occur outside the water too because of wet or unstable surroundings. Therefore, always tread carefully. — Using inflated car / truck tubes in open bodies of water pose a significant risk. Only use floating devices specifically produced for swimming / rescue. Heat strokes or severe dehydration are not uncommon due to carelessness from over exposure to the sun. — Keep cool and hydrated by drinking plenty of water. — Cover the head and nape of the neck when out in the sun. — Use sun-block and encourage more breaks in the shade during extended outdoor activities (games such as cricket, soccer, walks, running, etc). — Wear light coloured and light-weight clothing. — Tea, coffee and other hot drinks should be avoided as far as possible or their consumption should be drastically reduced. — Take a cold shower at least a couple of times a day, if possible. Alternatively pour water over the head to cool, and wipe off, especially if working outside. — Move the individual to a cool area quickly. — If the individual is conscious, give them cool water to sip but avoid all medication unless prescribed by the doctor. — Cool the body by sponging with cool (not cold) towels or sheets to lower the body temperature. — Ventilate the area by using a fan, opening windows and doors. — Consult a doctor always and immediately, especially if you are aware that the person may have a medical condition such as high blood pressure or diabetes (levels of salt and sugar used to rehydrate will need to be controlled). Children and senior citizens are most vulnerable during the summer months. With school holidays around the corner children may take up extracurricular activities and spend far more time outside than they would during school days, thus exposing themselves to the heat, while the elderly, even when indoors, suffer because of the heat and poor ventilation. Therefore, a responsible adult must be trained to watch out for signs of heat exhaustion and immediately provide support or call for help.